The netsh (network shell) command can be your best friend, if you let it. As the world moves to Server Core enviroments, and we will, you’ll need to use this command. It’s been around since the new technology (NT) days, so if you haven’t used it because the trusted and true GUI (graphical user interface) was there and much more intuitive than the command line, that’s ok. But, it’s time to change. Security and Virtualized environments will be the main drivers behind the adoption of Server Core based infrastructures, according to many, many, a whitepaper. And, that just makes sense. 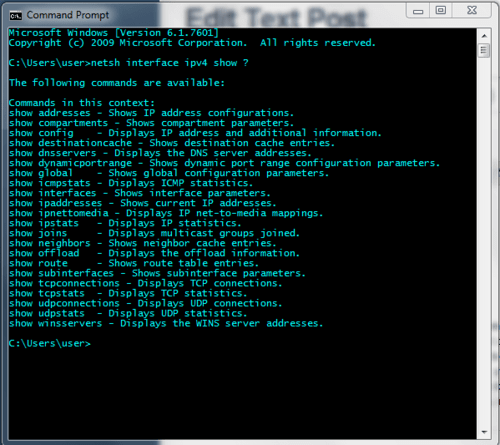 Open a command prompt, it’s time for some Ipcongfig on steriods. You’re presented with a graphical display of the various internal commands associated with the network shell. Now, pick one of these internal commands to learn more. In the figure 1 below, I have chosen the interface command, or as I like to think of it (ipconfig on steriods). Want to know more? Just pick one of the internal commands the are presented to you with the first typing of the /? and then type that command after netsh followed by a ? mark.